The world of industrial automation is increasingly taking cues from the world of commercial technology design. As engineers develop their skills in a world surrounded by familiar interfaces and virtual representation of analog components it’s easier than ever to incorporate UI and display elements from the devices we use every day. Industrial automation has already incorporated smart devices like tablets and smartphones and taken SCADA and HMI to the cloud. Here are a few trends we’re seeing now that may play a role in how we interact with our smart embedded systems in years to come. We know haptic feedback as the little vibration that occurs when we type on a virtual screen. Without haptic feedback on a virtual keyboard, our fingers have a difficult time associating the tap on a perfectly smooth screen with the letters that appear under the glass. Haptic feedback is used in video games and movies to immerse an audience in the content, or it might be used to trigger a physical response in the form of a rapid button-push. Haptic feedback may one day be incorporated widely into embedded machines, too. It could alert us to alarms, confirm alarm acknowledgements, warn us if data is trending toward dangerous levels, or offer feedback on actions taken by the operator. For example, if an operator tries to stop a machine, the settings might trigger a haptic response and a notification that asks the operator to confirm the action. This two-level response on both a visual and physical level can help prevent accidents or increase operator awareness. Secondary displays are already popular in many media formats. Consumers use secondary displays to use a smartphone while watching movies or television shows at home, and many game consoles have made use of secondary displays to relay status information or maps without taking the player out of the immersive experience. 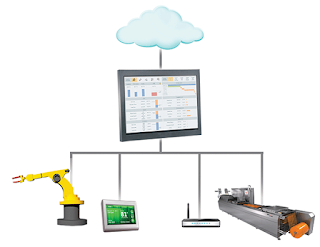 Secondary displays in industrial automation might be used to offer diagnostic information on machines, OEE data, trends, or the status of alarms without forcing the operator to navigate through multiple HMI screens. Flexible displays are not quite prevalent in the commercial market yet, but it’s already easy to see how they could be used in an industrial setting as well. Flexible OLED and AMOLED displays might be used to display information on individual parts, or put a HMI on just about any machine. Machine builders may also take advantage of bendable or curved displays to embed information on devices where the shape of the machine might otherwise prevent the addition of a standard rectangular panel. We’re already seeing the results of immersive virtual reality in the medical and architectural fields, where a three dimensional display can allow professionals to visualize and interact with virtual environments that would be impossible to navigate otherwise. The possibilities for immersive virtual reality in an industrial setting are endless. Machine builders might use immersive VR to prototype and build machines. Operators could use a VR headset to navigate dangerous environments and interact with machines remotely. Virtual reality could also act as a training mechanism for engineers. Augmented reality is information or content that is superimposed over existing physical elements. Heads up displays like Google Glass and smartphones are ideally suited to augmented reality. It’s easy to see how such technology could be useful in an industrial setting. Imagine being able to use a smartphone to pan over a machine and see potential problem zones highlighted in red. Augmented reality could be used to troubleshoot potential problems with a line, or it might be used to direct operators to places on the floor where they’re required. Augmented reality could even be combined with barcode or scanning technology to offer specific information about parts without distracting the user from seeing the physical item as well.